Metabolic engineering optimizes genetic and regulatory processes in microbes to increase the yield of key compounds, chemicals, and proteins for pharmaceutical and nutraceutical ingredient development. Microorganisms, such as E. coli and S. cerevisiae, are popular cell sources for these molecules, and with the recent CRISPR/Cas9 technology breakthrough, genome editing in bacteria and yeast has become more efficient and precise. GenScript is pleased to introduce the Microbial genome editing service for knock-in, knock-out or gene replacement in bacteria (E. coli) and yeast (S. cerevisiae). Our service employs a two vector system to target up to three genes simultaneously, ensuring editing accuracy down to the base pair. In addition, to further improve efficacy in bacteria, our scientists have developed a novel λ Red-CRISPR/Cas9 system, which leverages the efficiency of traditional λ Red recombineering with the ease of CRISPR/Cas for seamless, targeted genome editing. 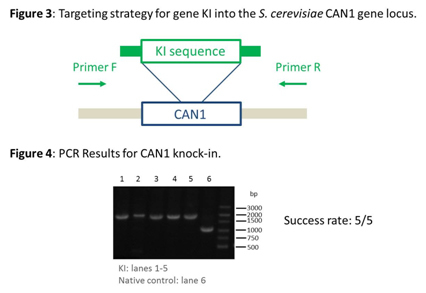 *Standard gene synthesis services (SC1010) can be used for the KI gene insert. Click here to learn more about pricing and turnaround times. **Pricing does not include the additional cost for gene synthesis, if required. CRISPR/Cas9 was used to delete a 400 bp sequence in the CAN1 gene to block gene expression (Figure 1). PCR of the recombinant strains yielded bands 400 bp shorter than the native strain, demonstrating successful gene knock-out (Figure 2). A 100% CAN1 knock-out success rate (10/10) was achieved using this system. 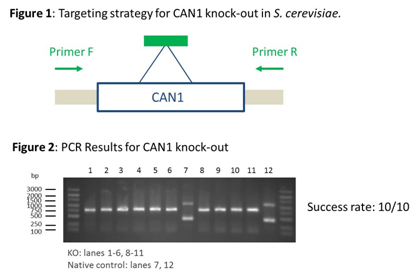 The CRISPR system was used to insert a 1 kb fragment into the CAN1 gene to test KI efficiency (Figure 3). PCR of the recombinant strains yielded bands 1 kb longer than the native strain, indicating successful gene knock-in. A 100% success rate (5/5 strains) was achieved using CRISPR (Figure 4). Metabolic Pathway Assembly Service: optimize expression of multiple genes simultaneously. RBS Design: maximize translation of your target protein using our ribosome binding site design algorithm. CRISPR/Cas9 Technology Resources: Learn more about the CRISPR/Cas9 genome editing technology, find experimental protocols, or watch our free instructional webinars. Orders can be placed by phone, email, or fax with a formal PO (Purchase Order) or credit card. We would like to acknowledge Professor Sheng Yang (Shanghai Institutes for Biological Sciences, Chinese Academy of Sciences) for contributing the original plasmids for the microbial genome editing service. The plasmids were subsequently engineered by the GenScript team to meet the service needs. *The legal statement below applies to eukaryotic cells only (including yeast); currently, bacterial cells (E.coli) are exempt from these regulations.